Speed (page or content) Download: One of the primary and obvious advantages of CDN Networks is the reduction of the page load or download time. When you access a website without CDN, there would be enough load on the primary webserver, also there are limitations with respect to distance at which it is located versus the location of the end-user accessing it. So a CDN served website will be much much faster than the same website without CDN. You can see a huge difference of 30-70% reduction in the overall website loading time. Location of the CDN Caching Nodes: In most cases this improvement happens so much so, that the end users feels as if the page getting loaded instantaneously. So the primary reason for it is that, in many cases sometimes the ISP you get Internet may have these CDN Caching nodes too. Sometimes the CDN Service providers will pay the money for that, and sometimes the ISP firms keeps them for free of cost, since in both cases it is going to improve his customers Internet experience. Also with a CDN Caching node, the ISP will make huge bandwidth savings with respect to his backbone Internet infrastructure. Reduction in Routed Network Hops – No more long distance Routing Bottlenecks: In any case since these CDN Nodes are mostly situated within the same ISP Network(s), the number of hops are greatly reduced, hence overcoming the basic bottlenecks of long distance routing ! Load Sharing: Like Scalability factor, everyday load-sharing for large websites are addressed always by any CDN Network services. Since there are large number of dynamic CDN Nodes are deployed across the Internet spread across geographically, often when there is a case if a specific CDN Node (or few Nodes) are congested or addressing huge load of traffic/requests at a specific moment of time, then the upcoming new page requests can be served via other CDN Nodes which are less occupied. Any sudden surges in website hits, (due to any live events such as Sports, or Music/Pop concerts) are better address always by CDN Networks. The CDN Nodes usually handle dynamic load sharing. Redundancy and High Availability: Redundant and high-availability are the other main added advantage of CDN services. 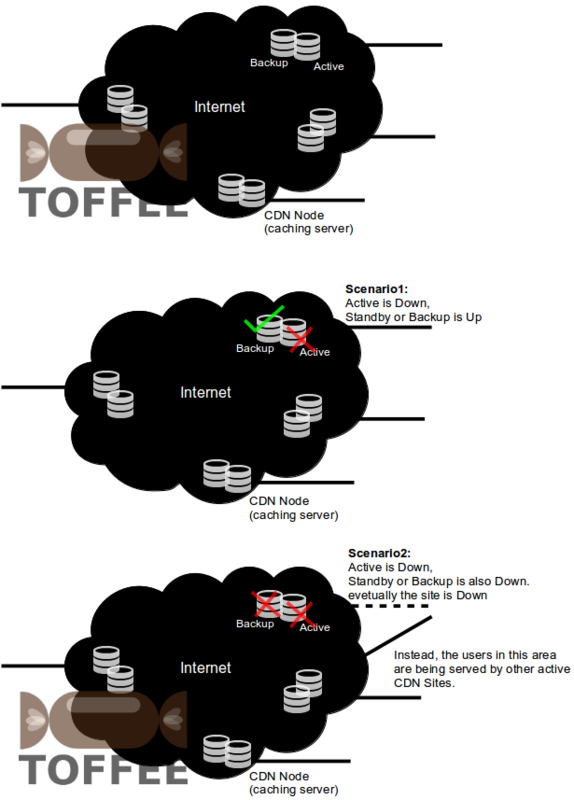 If there is a failure of one CDN Node, then the other nodes offer immediate high-availability backup mode operation. The entire CDN Infrastructure is redundant and so the redundancy of the content availability and eventually the up time of the targeted website. 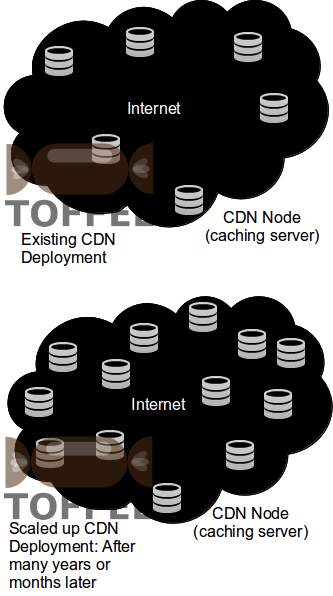 High-Availability and Redundancy per CDN Node and to the whole CDN Network Infrastructure: In most cases per CDN Node location, the CDN Service vendor may offer redundant caching servers, to offer high-availability in each single CDN Node point, as well as redundancy and high-availability of the entire Distributed CDN Network. Scalability: Scalability is one of the most important requirement for any large and most commonly used websites. When the website is new or the company is new, there may be less number of hits per day, but eventually once it gets more and more popular, and it gets more and more users, then the main challenge is to address the scalability factor. Scalability is often a requirement where infrastructure team needs to address progressive way, in the sense upscale the infrastructure as the need arises every quarter, or half yearly or annually. Hence it is one of the expensive decisions a company need to take care of and address it when there is a demand for now or in the near future. Portals – Job Portals, Dating Portals, etc. Online Analytics – stock market analysis, other business analysis, etc. Live Events – Concerts, Sports, Political Speeches, etc. Application Specific Acceleration and Content Specific Acceleration: Sometimes there can be dedicated or hybrid CDN Networks built to address specific application content delivery. In such a case for example to deliver videos there can be a different dedicated type of CDN Node. And to deliver audio and other streaming content there can be another type of dedicated CDN Node and so on. So Application Specific Acceleration and content delivery specific to application, such as media, flash videos, streaming songs, online live TV, music servers, on-demand media services and so on is always possible and yet another main advantage of CDN Networks. Security: One of the biggest advantages of CDN services is also the ability to provide a secure platform. Since often the times the website is vulnerable for any attacks, sometimes if the CDN nodes are more secure and more managed, then it can also offer/serve as a highly secure platform. Many times often these CDN nodes are generic nodes, and they share the same hardware across various other websites which they are providing CDN service. Hence by default these nodes are quite secure by themselves. So this differentiates the level of security which a hosting server or the source/origin web-server can offer, and a CDN Network hosts can offer. Hence there are cases that these CDN nodes also logs if there are any attacks on the same. This gives an immediate platform to then and there to monitor the same. With hosting only usually we do not get to have a chance to get these extensive analytics. This is also one of the advantages of a CDN service.